the obsessive imagist | art, design, life: OH, JUST GOOGLE ME! A while back the blogosphere was abuzz with the graphic design work of Ji Lee, particularly his brilliant "Google Me" business card. Lee, realizing a Google search for his name would immediately direct you to his website, simply decided to cut out the middle man. Creating a business card that encourages you to google him is not only a fabulously creative idea, but also a great way to ensure people check out your portfolio/website. 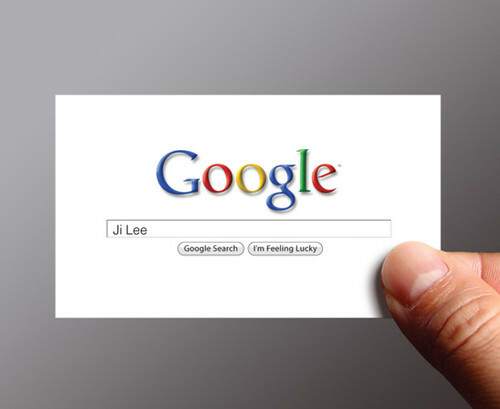 All that said, Ji Lee is now generously offering a download of a blank version of the 'Google Me' business card--which you can customize and print with your own name. Just make sure your website is the top search result (you wouldn't want to direct traffic to someone else's website with your business card!). Download a copy of the business card here (it's linked to the second image) and check out his other work here.